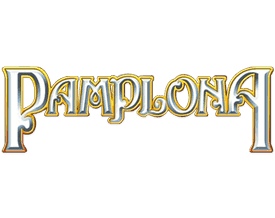 Where to Play Pamplona for Real Money? Amid the seemingly endless ocean of slot adaptations and homages to popular films or television series, it might be refreshing to see one that is not based upon any existing franchise or intellectual property. 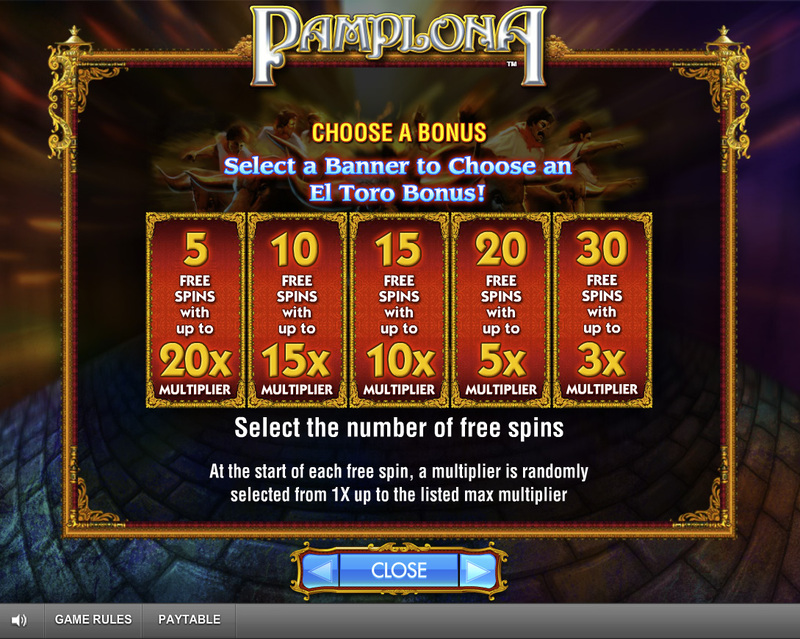 IGT’s Pamplona slot instead takes inspiration from Hispanic culture - and funnily enough misses the mark. While the two events are connected and both traditionally occur during the Sanfermines festival, the event which is internationally known as the “pamplona”, named after the city, is bull running. Six bulls are set loose in a sectioned-off part of the city, and men can show off their bravado by running in front of them. However, the symbols shown in the Pamplona slot are obviously more focused on bull fighting, during which Matadors enter the ring with a bull, tasked with taunting and eventually killing the animal. 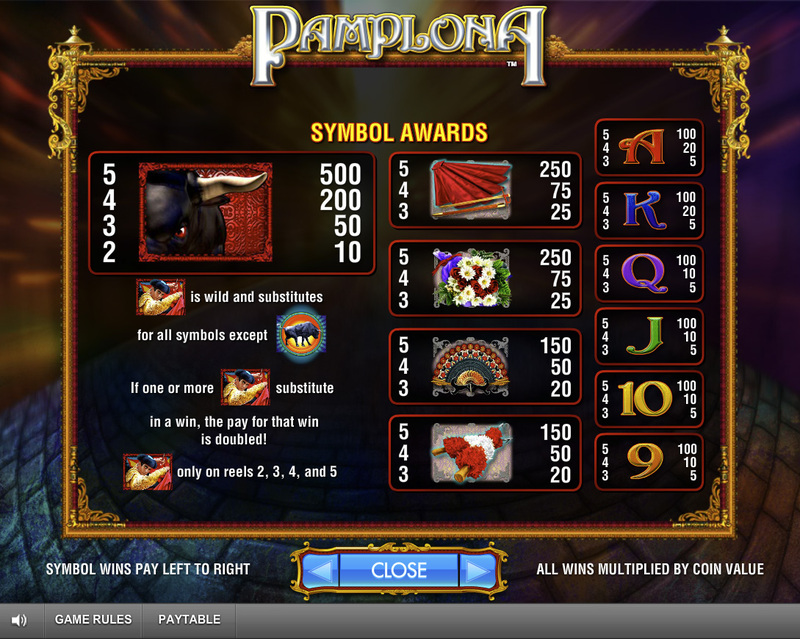 How to Play Pamplona Casino Game? Whatever you may feel about bull fighting, it is certainly an important - and pretty iconic - part of Hispanic culture. 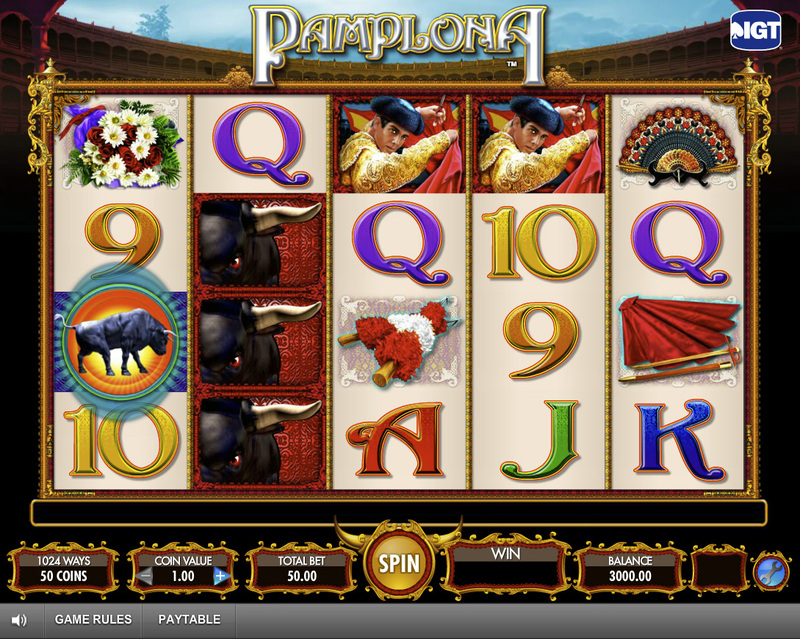 The Pamplona slot tries to recreate this tradition in a five reel slot with an insane 1024 paylines. While this seems pretty high, especially in relation to the majority of slots having 50 or even only 25 paylines, the payouts of the frequent wins is sufficiently low. In accordance with the paylines, the betting limits are pretty low. The range is 1 to 30, which is odd seeing as many slots offer a minimum wager of <1, pairing it with mid-range roofs. This certainly is a slot aimed at the casual crowd. Visually, Pamplona is a bit… schizophrenic. The symbols aren’t particularly good looking - they’re decent and get the job done, but it isn’t anything to write home about. The interface feels pretty budget (the rules redirect you to a different page, and there is no roll-over payline legend), the borders of the various windows overlap… it just feels like someone was paid $10 to throw something together in MS paint. However, then there are the 3D bull animations that actually look pretty damn impressive. Of course, there is more to Pamplona than just hitting spin again and again. Well, not a lot more. There is a grand total of one bonus feature in Pamplona. Granted, it does offer some variety and player choice, and also has the possibility to grant you some massive wins. Whenever you hit three scatter symbols in the form of the bull (not the frontal, half-bull face, but the side-view of the bull with a blue background), you’ll get the El Toro bonus. 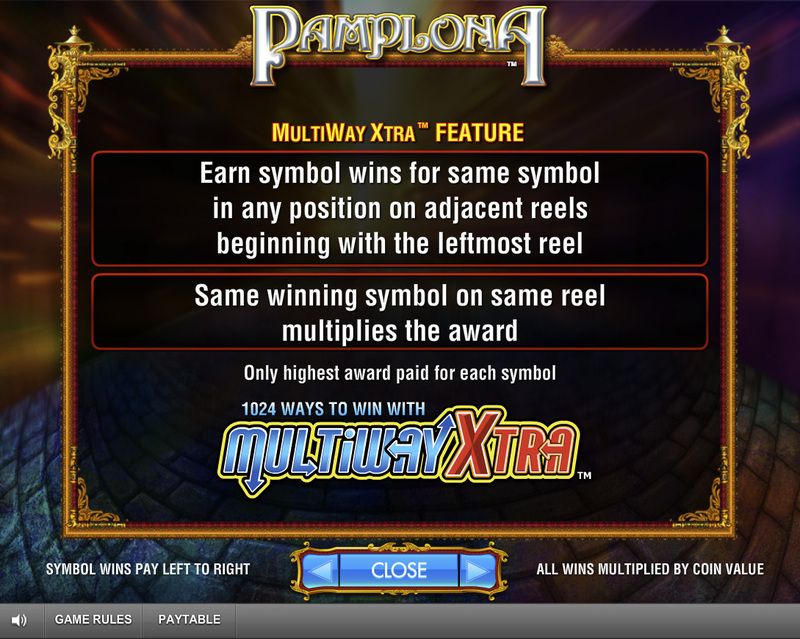 Here you can pick from five different variations of multipliers coupled with free spins. Either you get many free spins, with a low multiplier, or a high multiplier with fewer free spins. In a rather hilarious disparity, while attending the actual Pamplona would probably leave you with an astronomical heart rate, the slot of the same name isn’t exactly a particularly exciting affair. Whenever you hit the El Toro bonus, you’ll likely be more satisfied than bursting with joy, and there isn’t any other feature included to ramp up the thrill. Pamplona isn’t particularly good or bad, it’s just kind of… there. The visuals are dated, but the animations are solid. There is only one feature, but it provides wins and variety. You won’t be excited, but you won’t be bored either. This here is a picture perfect example of “average”, and our stance on it is “indifferent”.